Weather Modification, Inc. Aircraft, Sales and Leasing - Weather Modification, Inc. Weather Modification, Inc., has been modifying and operating aircraft for cloud seeding and atmospheric research operations since 1961. 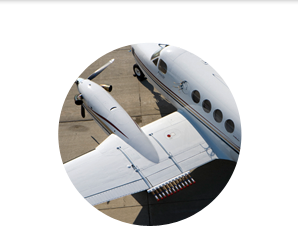 We maintain and operate a fleet of more than 35 twin-engine aircraft in various configurations that meet the needs of every client. Length 28 ft. 07 in. Height 9 ft. 11 in. Wing Span 38 ft. 11 in. Wing Span 38 ft. 1 in. If you operate your own aviation fleet, we can provide custom-modified aircraft to match your specific mission requirements - or we can modify your existing aircraft to perform the operations required. Our talented team of experienced technicians facilitates the entire process - from design to modification to US Federal Aviation Administration (FAA) standards certification. Weather Modification, Inc., can also perform any necessary maintenance required or upgrades requested by the client during the modification process. The STC ensures that equipment is built and installed to the highest aviation standard for safety and performance. Let us locate, evaluate, and facilitate the purchase of a suitable aircraft for your needs.